Over the last decade, Blair Bethwaite has had a front-row seat for some major evolutions in the types and applications of technologies supporting research. Through roles at Monash University and collaborations with Nectar and OpenStack, he’s personally helped usher in new research software developments, high performance computing platforms, and cloud architectures. Now, he’s joined NeSI as its new Solutions Manager, putting him in a prime position to help NeSI navigate an evolution of its own. An ex-pat New Zealander, Blair moved from Melbourne back to his hometown Christchurch in August to take on the new role with NeSI. At Monash University, Blair’s roles involved high-throughput computing research, software development, as well as application and user support. He also designed and built the current generation of MASSIVE, Australia’s specialised high performance computing facility for imaging and visualisation - a collaboration between Monash University, CSIRO, the Australian Synchrotron, the ARC CoE in Integrative Brain Function, and the ARC CoE in Advanced Molecular Imaging. With MASSIVE, Blair successfully pioneered the operation of a specialised HPC capability atop OpenStack whilst simultaneously integrating and productionising new developments in GPU and interconnect technology. He made his first forays into scientific cloud computing in 2010 to support high-throughput applications, and when the National eResearch Collaboration Tools and Resources (Nectar) project was announced in Australia, Blair got involved on the ground floor. As use of cloud has grown within the eResearch sector, it‘s become a top focus for Blair as well. He is currently a co-chair of OpenStack’s Scientific Special Interest Group (SIG), an international group dedicated to representing and advancing the use-cases and needs of research and high performance computing with OpenStack. As Solutions Manager for NeSI, Blair says he’s looking forward to learning more about the existing collaborations, partnerships, and strategies within NZ’s research ecosystem. A common thread between Australia and NZ, he says, is that each country’s eResearch sector is still growing, so there’s a wide range of users to support, from experienced early adopters to those completely new to the tools. “We see a very big continuum of capability and that’s a very interesting challenge to support,” he says. If you have questions about NeSI’s new platform or would like to meet with Blair and talk about how NeSI’s solutions can support your research, contact us at support@nesi.org.nz. 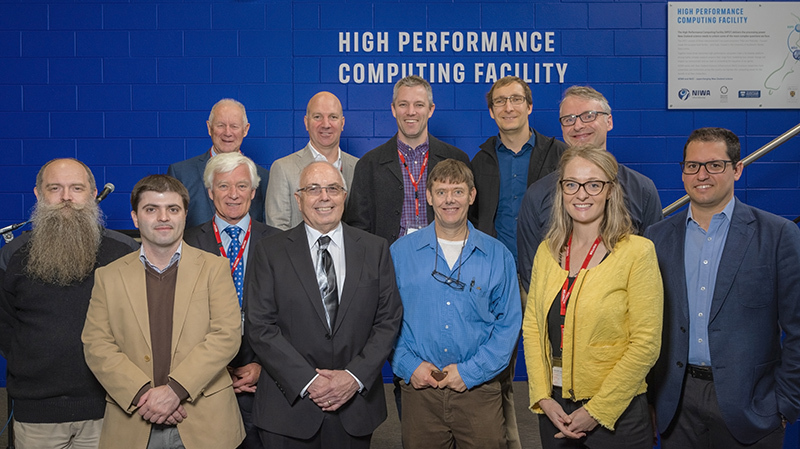 Pictured below: Blair Bethwaite with members of NeSI's Board of Directors, senior managment, and support team at the launch of the new platforms facility in Wellington. Back row (left to right) - Rick Christie, Nick Jones, Blair Bethwaite, Mandes Schoenherr, Wolfgang Hayek. Front row (left to right) - Aaron Hicks, José Higino, Murray Poulter, Michael Uddstrom, Alexander Pletzer, Georgina Rae, Fabrice Cantos.